If your browsers’ start page and new tab page have been set to Trackpackage.world, or default search engine have changed to http://trackpackage.world/search/?type=web&query=…, and you haven’t made these changes yourself, then you likely have a browser hijacker installed. A browser hijacker is usually a browser extension; it can set start page, default search, etc. to specific search engines. That boosts traffic for those search engines and increases revenue they get from advertisers or from sites they redirect people to (for example, Trackpackage.world redirects users’ searches to Google or other search engines). You may follow instructions below to uninstall the browser hijacker and remove Trackpackage.world from your browsers. 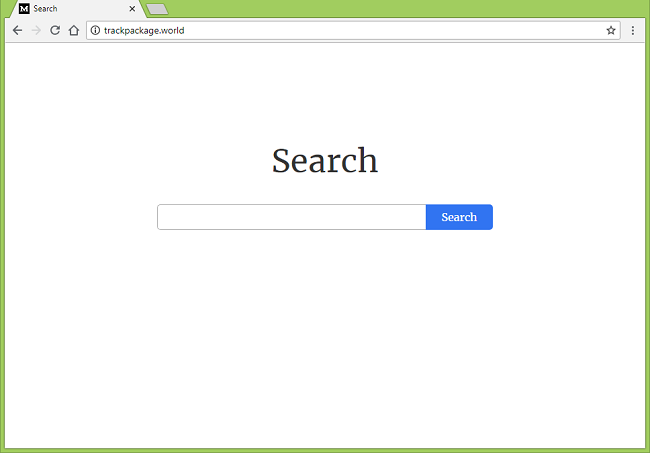 The easiest method to uninstall Trackpackage.world is to run an anti-malware program capable of detecting browser hijackers in general and Trackpackage.world in particular. You may try SpyHunter by Enigma Software; it has excellent detection rate when it comes to browser hijackers and other potentially unwanted programs (PUPs). You can also try to remove Trackpackage.world by hand using the following instructions. Go to Programs and Features, uninstall Trackpackage.world if you can find it there. If it isn’t there, uninstall suspicious programs, programs you don’t remember installing, or programs you installed just before Trackpackage.world appeared on your computer. When you are not sure if a program is safe, look for the answer on the Internet. To get rid of Trackpackage.world, either reset browser settings or remove any suspicious extensions from browsers and set new tab page and default search provider.